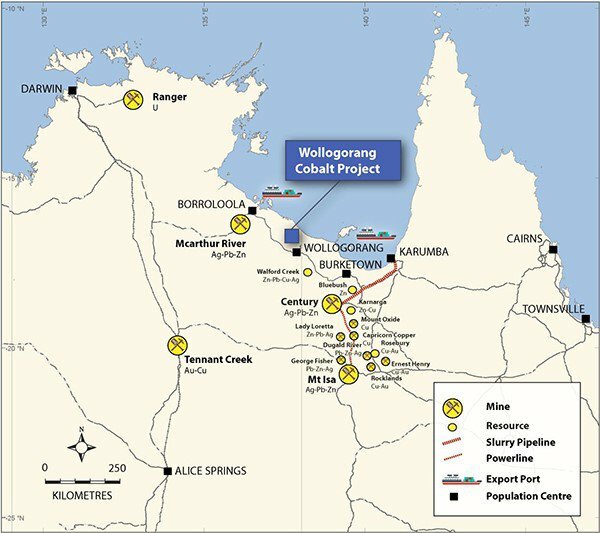 Following on from its successful ASX-listing in September, Northern Cobalt (ASX:N27) has published its first drill results from Wollogorang Cobalt Project in the Northern Territory (NT). N27 raised A$4.21 million in September, coming to the market with a succinct focus on cobalt exploration and eventual production close to end-user markets. 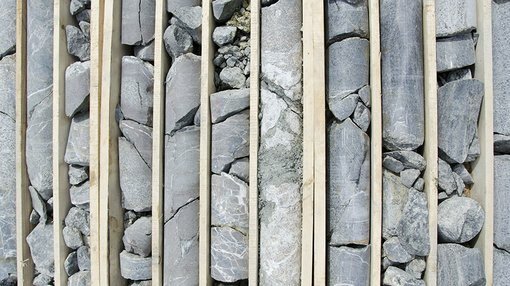 To further its strategy as an emerging cobalt development company, N27 has launched an extensive drilling program, consisting of 21 drill targets and over 100 drill-holes – many of which have yet to be drilled. N27 reports that it has received assays for the first five (of 57 total) drill holes from the Stanton Deposit and has also completed a further 104 drill-holes at the Wollogorang Project, with drilling ongoing. Highlights include 37 metres at 0.28% cobalt (Co), 18 metres at 0.33% Co and individual metre grades of up to 2.13% Co. N27 intends to shift its existing Inferred resource of 500,000 tonnes of 0.17% Co, 0.09% Ni, 0.11% Cu into indicated and measured categories in order to obtain sampling data for scoping and feasibility studies. It should be noted here that is an early stage company and investors should seek professional financial advice if considering this stock for their portfolio. The next batch of assay results is expected before the end November, with ongoing results expected to continue intermittently into January 2018. N27 hopes to have the necessary data to formalise its resource upgrade, now expected sometime in Q1 2018. 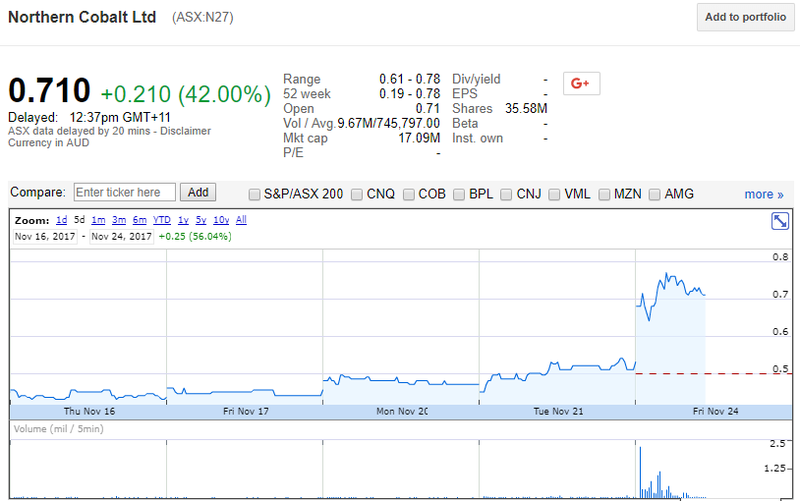 Today’s exploration update from N27 was taken positively by market participants, taking N27 shares higher on the day by 42%, at the time of writing. 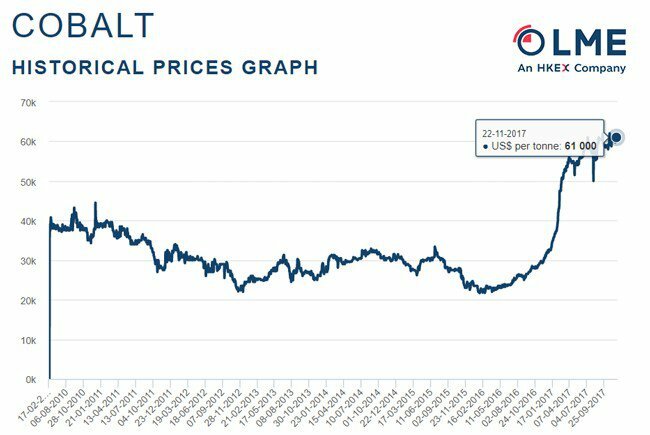 Meanwhile, cobalt spot prices have experienced consistent upward momentum since early 2016, rising from around US$20,000 in February 2016 to US$61,000 per tonne currently. A significant reason for higher cobalt prices has been dwindling supplies (in addition to strong growing demand coming from the lithium-ion battery sector). At present, over 50% of the worlds cobalt is mined from the Democratic Republic of the Congo (DRC) which has been cited by several global agencies as a high-risk region for mining activity. Taking into account the lack of confidence in the mining practises within the DRC – combined with DRC being the world’s largest producer — has meant DRC-sourced cobalt supplies have been prone to interruptions and supportive of market prices. The DRC is also under scrutiny due to the use of child labour and poor working conditions –particularly with artisanal cobalt production. In recent months, large-scale cobalt end-users such as Tesla and Apple have indicated their preference for using ethically-mined cobalt obtained sustainably, as opposed to questionable methods highlighted in the DRC. This factor has been a significant price-sensitive influence and is likely to remain significant going into 2018.